Fact: Fort George Brewery knows how to make outstanding IPA. Corollary: They also know the phone numbers of a lot of other great IPA breweries. Addendum: Their collaboration beers with those breweries are mind-blowingly good. 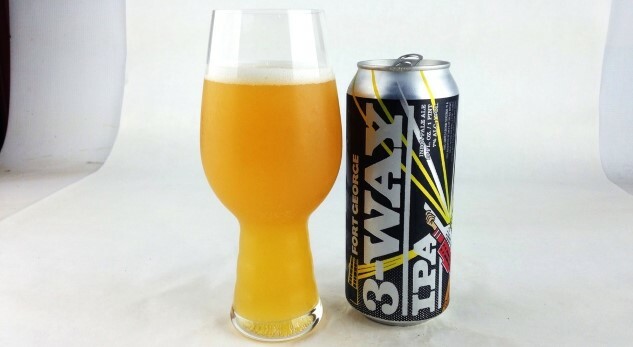 Case in point, 3-Way IPA, a yearly collab between Fort George and two other, rotating breweries, which first began in 2013. Since that point, Fort George has collaborated with the likes of Gigantic, Lompoc, Boneyard, Block 15, pFriem, Georgetown, Barley Brown’s and Melvin. We can’t speak to the quality of all of them—the first collaboration we had was 2016’s, but that beer just so happened to finish at number freakin’ 7 out of 247 IPAs when we blind-tasted American IPA that year. So yeah—it was a damn good beer. But this year’s 3-Way might be even better. And that’s scary. This year’s 3-Way IPA is made in conjunction with two other breweries we’ve been sampling with some regularity lately—Seattle staples Reuben’s Brews and Portland’s Great Notion Brewing Co., who have likewise gotten plenty of attention lately for their nouveau IPAs. It’s another outstanding triple pedigree, with spectacular results. The beer pours a vibrant, luminously turbid gold—not quite as chunky looking as something out of say, Tree House, but not far off from it either. On the nose it presents huge, sweet and juicy pineapple notes that you can smell from two or three feet away with no difficulty. There’s big citrus there as well, but also some complexity in the form of prominent floral impressions. The cans say that the beer “features Azacca,” which initially made me think this might be a single-hopped beer, but the full description via Fort George’s website reveals that Azacca was simply one player in a lineup that includes Citra, Mosaic and an experimental varietal designated X331. So that explains some of the differing aromatic impressions. On the palate, this beer is creamy in texture, with a full mouthfeel and velvety smoothness. Bitterness is low but not completely nonexistent, but it simply clears the stage for super juicy fruit flavors. Pineapple chunks once again, with a touch of syrup, but it’s not overly saccharine. Grassy and floral, greener hop impressions follow, with lemon citrus. More than anything, the mouthfeel makes it feel sumptuous—the best version of the NE-IPA beer texture, in the sense that this is what they’re all going for. It’s no secret that there are some bad NE-IPA’s on the market today, as breweries try to ride the wave of that trend and embrace the haze. But it makes me sad to have conversations with some professional brewers these days who are more or less unable to appreciate a beer in the style of Fort George 3-Way. This beer is simply delicious; juicy but also complex and approachable by an entire contingent of the market for whom IPA was never an attraction. In a phrase, this kind of great beer is what modern IPA is all about. If you’re unable to wrap your head around it just because of how it looks in the glass, then I can’t help but feel like you’re missing out. Jim Vorel is a Paste staff writer and resident beer guru. You can follow him on Twitter for much more drink content.